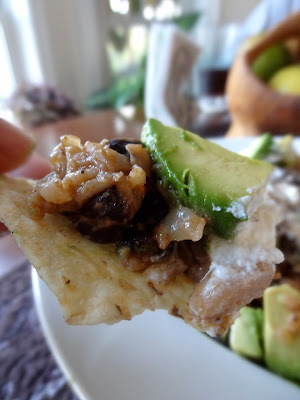 Unlike regular Mexican nachos,this rice bean nachos full with Asian spices ingredients and cook with coconut milk and there is no cheese in it,that why I call it "Asian twist"
In large soup pan heat olive oil fry chopped onion and garlic until soft add cinnamon stick and star anise. add rice,coconut milk and water bring rice to boil then simmer and covered until rice are soft/tender it take about 10- 15 minutes or so. add the rest of spices ingredients and add beans stir and continue simmer for another five minutes. 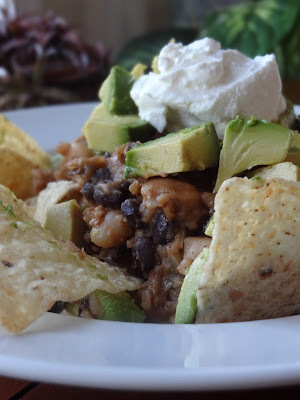 ready to serve on top of corn tortilla chips,with chunk avocado and sour cream as topping. Enjoy and have a great weekend !! I am totally intrigued by your Asian-spiced nachos. Love this Asian-Mexican fusion! Very creative and you are surely getting better in coming up with your own recipes. Nice flavours and of course, Asian twist is my fav too.